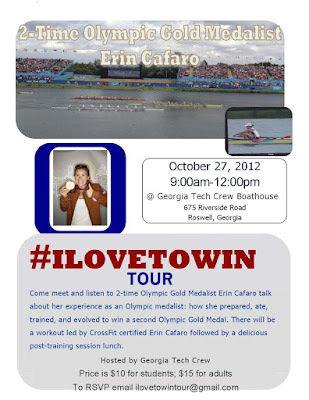 Meet 2-Time Olympic Gold Medalist, Erin Cafaro, this Weekend at the GT Boathouse! Come meet and listen to two-time Olympic Gold Medalist, Erin Cafaro, talk about her experience as an Olympic medalist: how she prepared, ate, trained, and evolved to win a second Olympic Gold Medal. There will be a workout led by CrossFit certified Erin Cafaro followed by a delicious post-training session lunch. The event will be held on Saturday, October 27, 2012 from 9:00 am - 12:00 pm, at the Georgia Tech Crew Boathouse, located at 675 Riverside Road, Roswell, GA. The price to attend is $10 for students and $15 for adults. The proceeds go to help GT Crew. Please e-mail ilovetowintour@gmail.com to RSVP.